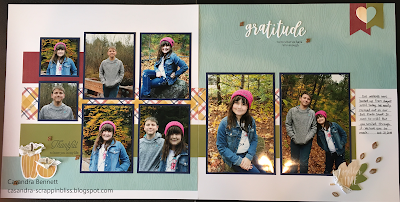 I'm back again today with another page using the Grateful Heart paper collection. This was scraplifted from the Holiday Expressions book. I think only the title was changed because I had already used the blue one. My kids love to hang out with Grandma (and Grandpa, too). I jokingly asked my mom if she was excited to spend her 2nd "First" Christmas in her new home. I think it was about 21 years back that my parents had owned this house for one year. Then, my brother purchased the home from them and after many years of single life, he married and now has 2 girls. They quickly outgrew the house and since both were looking for new homes to either upgrade or downgrade to, it was an easy decision for my parents to take ownership of it for the second time. I snapped this picture with my iPhone, so it's just a tad dark, but I think it turned out super cute, nonetheless. I'm really starting to like creating single page layouts. They are just perfect for that odd occasion where you only get one or two pictures. Have a happy, cozy day! 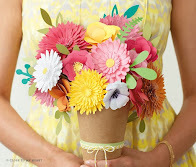 February is a great month for papercrafting. We have several promotions being offered right now, and there's sure to be something for everyone. 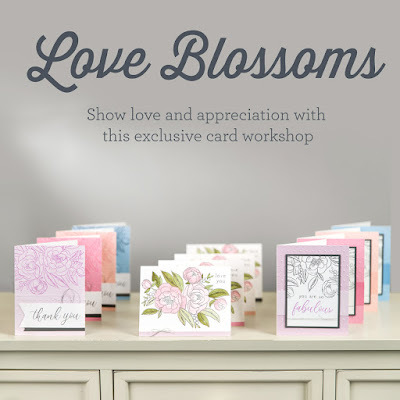 How sweet is this card set with the Love Blossom Stamp set? 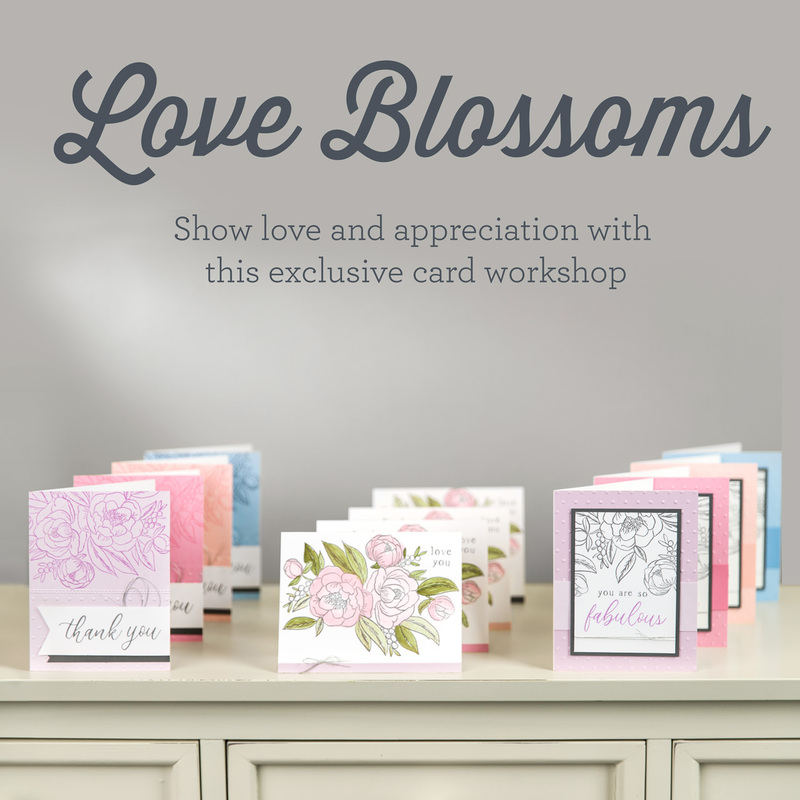 Create the beautiful cards shown using this exclusive stamp set and workshop bundle, or design your own! It's available here now through the end of March, while supplies last. Next up, we have the ever-popular (and my favorite) "Stamp of the Month". 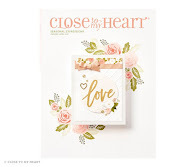 February stamp of the month – Heartfelt Sentiments is an exclusive D-size stamp set – only available in February and can be yours for $5 when you place a qualifying order of $50.00 or more! Be sure to check it out here for more detail. 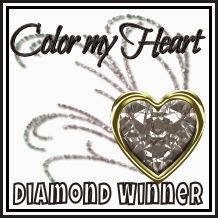 And last but not least, we have the "Heart Happy" promotions still going on this month, while supplies last. Cardmakers, scrapbookers and papercrafters unite! I showcased the exclusive workshop bundles for Heart Happy in a previous post; be sure to check it out here for further details. To see these promotions (and more), be sure to head over to my online shop. I have to say that it's kind of nice that the kids have gone back to school. I like a snow day as much as they do, but three this week was starting to make everyone antsy. I am back today to share with you another layout using the Grateful Heart paper collection. 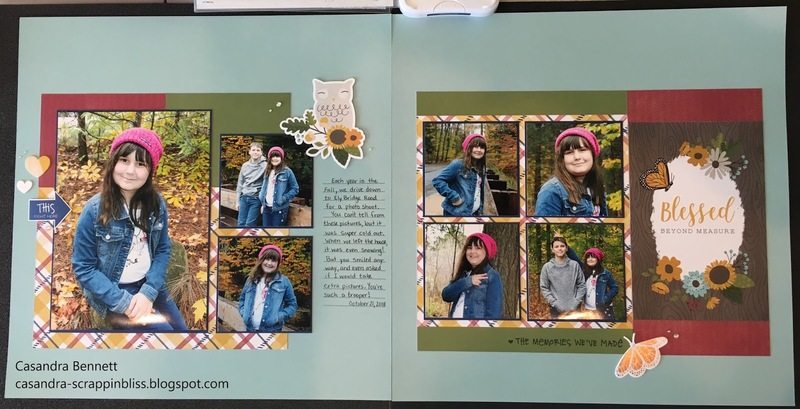 I created this layout for my daughter's album. It was super cold the day we took these photos. She was such a trooper, though. 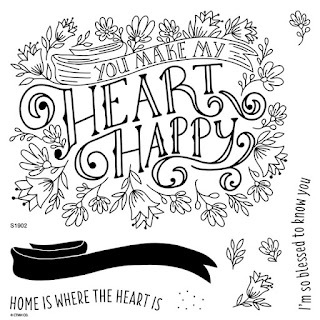 If you use the Close To My Heart sketch books, you may recognize this as Pattern 26 from the MIFYH Volume 3. As I was trying to decide what pattern to use, it had to have a couple of things. 1) A 5x7 (Portrait) photo, and 2) be able to fit at least 7 photos. We took a ton of pictures, and it was hard to narrow down my favorites, especially for my girl. You may also have noticed that I tend to mat my photos; it just feels more finished to me. I didn't want to compromise on trimming down my 4x6 photos anymore than necessary, so I used an 1/8" size mat border instead of my usual 1/4" size. The other thing I did here was to use a lot of colored cardstock...bases, photo mats, and even one of the cut patterns (green). I also added some stamping from a "Story by Stacy" stamp set. It's the first time it got inky, and I love how it turned out. I decided on the glacier bases instead of white so it would enhance the colors going on in the pictures. Isn't it cute? I will definitely use this sketch again. Let me know what sketch is your favorite to use. I'd love to try something new. Thank you for taking time to stop by. Have a blessed (and warm) weekend. 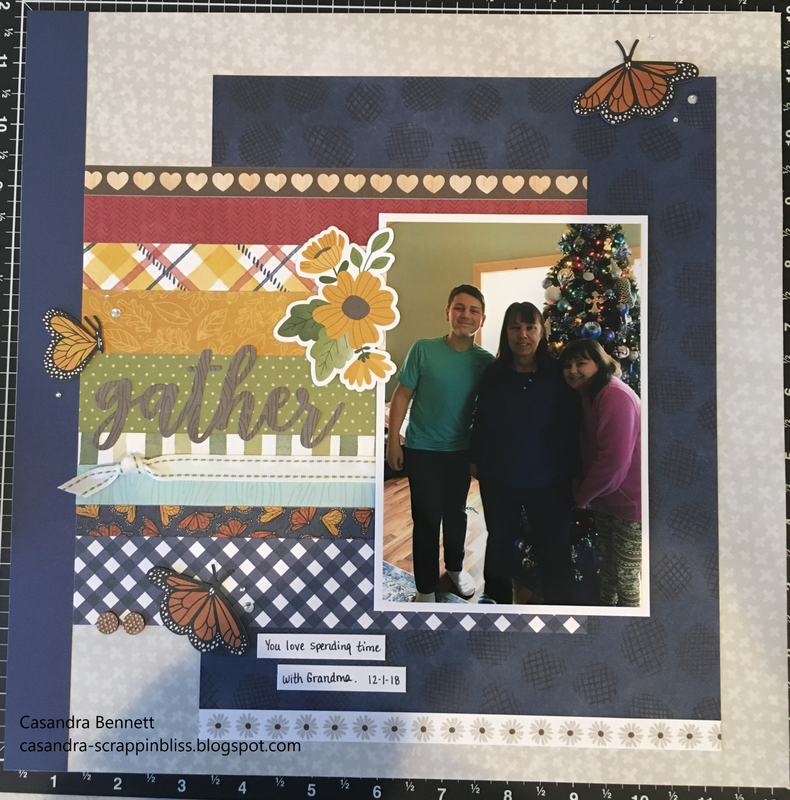 I am back again today with my 2nd layout using the Grateful Heart paper collection. It probably isn't noticeable, but after I laid the title on the die-cut leaves, it really didn't stand out. Because of it's thin font, I didn't think backing it with foam tape would be the best option. So I glued it down to white cardstock and fussy cut around it to help it pop more against the leaves. I then backed this with foam tape and I'm happy with the results, though it took a lot of patience. I also switched the pages around to not only showcase more photos, but also their orientation. Have you ever noticed that a professionally designed layout shows the photo subject looking from left to center, or (from the right page) right to center? It's a subtle detail, but it really makes an impact on the overall feel of a layout. One last detail to talk about. Since I wanted to squeeze as many photos onto this layout as possible, I chose to add stamped journaling lines instead of a pocket journal card. 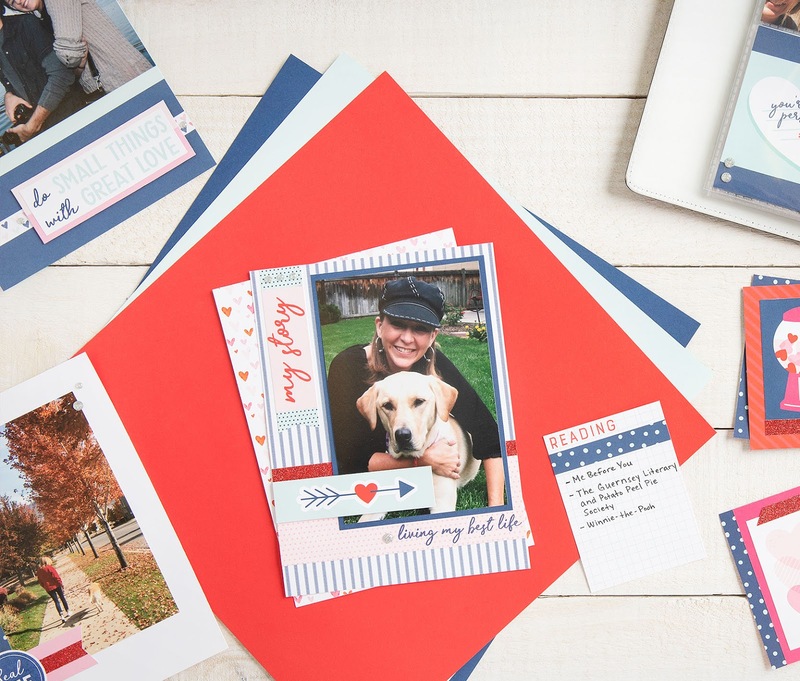 However, if you don't want the "clutter" of stamped journaling, simply add a journal card in place of a 3x4 photo. 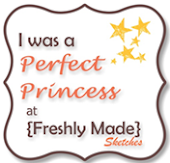 Don't be afraid to change a sketch up to suit your photo needs. Make it fun, but make it yours. I have been housebound since Friday. We have been getting tons of snow, wind and bitter cold temperatures. This makes for 3 snow days in 2 weeks, and stir-crazy kids. In the meantime, I've been playing with paper (stamps, thin cuts and even my cricut!). Here is the first layout I have to share with you. 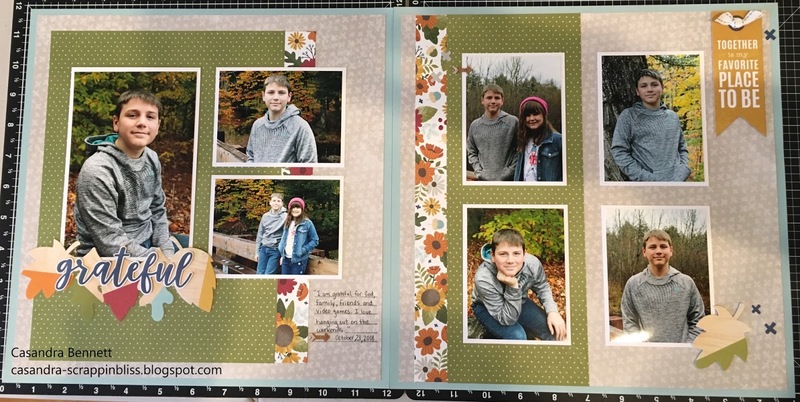 This is my favorite layout using the Grateful Heart paper collection. I've used this sketch several times and it's never disappointed me. 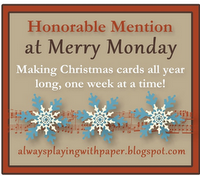 I used a retired SOTM we had from two years ago called "Blessed Beyond Measure". It coordinated well with this paper collection and the theme of my layout. For the most part, I only create layouts for my kids' albums, or to gift to others. Now that the kids are growing into the pre-teen age, I find myself thinking about when they move out and take their albums with them. Then, I have only my memories and lots of photos. So for those extra special photos, I decided I need to be better about creating layouts for my album(s). It looks like this kit just sold out. As of today, you can still purchase the coordinating cork shapes and complements (stickers and die-cuts). However, the paper is gone. If you like to stamp, remember that even a sentiment image can help take your artwork to the next level. Sending you warm winter wishes, my crafty friends. So, as some of you know, I run a seasonal business with my husband. Seasonal, meaning April through November. During those months, I have limited time to craft. 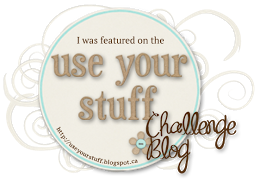 And one of the things that gets sadly neglected is my blog. Oh, how I loved blogging, and staying connected with all of you. Since October, I've actually completed three scrapbook albums. Three! Two of them are school albums that I created for family members. The other one is a pocket album that I created as a "December Daily" album. 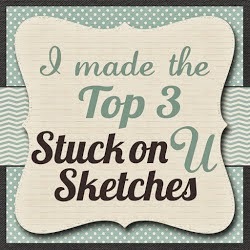 I loved how that one turned out, and it allowed me to explore stamping and new ways to make pocket scrapbooking fun. With that thought in mind, I wanted to share with you a current promotion that is available through the end of February (2019) while supplies last. It's called Heart Happy. And boy does it EVER make my HEART HAPPY! 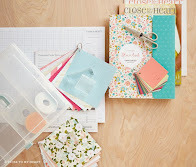 For the pocket scrapbooking kit, please visit my website here. 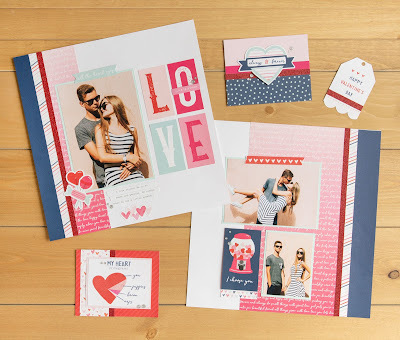 I actually purchased both kits to create a pocket album, as well as the traditional layouts, cards and tags. When you go months without papercrafting, you do find time to think about what it is that makes you happy. For me, it's stamping. And BOTH of these kits include stamping!!! 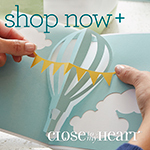 If you would like to purchase any of the scrapbooking/cardmaking supplies, please visit my website here. 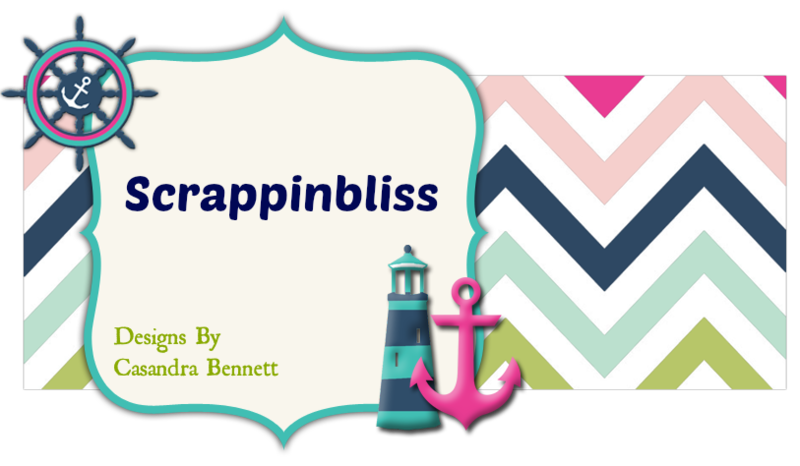 Just a quick note to let you know that I am on Facebook with a Scrappinbliss - Close To My Heart Independent Consultant page. Come find me there. Hope you are all well and starting off your New Year with much happiness. If you've been following my blog, then you know that I will be throwing a campfire birthday for my son next month. I saw different favor bags and boxes on Pinterest using this theme, but decided to create a pillow box for Jackson's favors. I will be filling them with a marshmallow, graham crackers and Hershey's miniature chocolates. I used a retired stamp set that was out in December. If you recall, I used this same stamp to create my children's Valentine's cards with. Goes to show how versatile that stamp set is!